St Michael’s Church is located in Jermyn, PA, which is in the Mid-Valley region of Northeastern PA. Jermyn is located approximately 8 miles north of Scranton and 4 miles from Carbondale. Take the new Rt 6 east to the Jermyn exit. Go to Bonnie Dr, then turn left onto Delaware St. Turn right on Walnut St, and the church is on the left at the corner of Walnut and Hudson Sts. Park on the street. Take the new Rt 6 west to the Jermyn exit. Go to Bonnie Dr, then turn left onto Delaware St. Turn right on Walnut St, and the church is on the left at the corner of Walnut and Hudson Sts. Park on the street. 8:00 AM Matins (7:30 from Memorial Day through Labor Day). 9:30 AM Divine Liturgy (9:00 from Memorial Day through Labor Day), followed by Fellowship Hour. For a list of upcoming services, please see the most current Weekly Bulletin on the parish website. 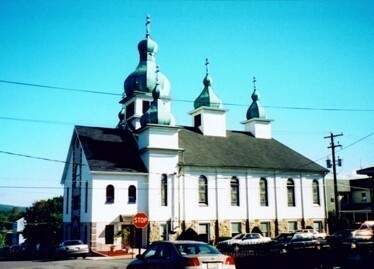 The history of St Michael’s Orthodox Church in Jermyn, PA resembles in many respects that of other Orthodox parishes in America. It reveals the hardships and struggles—and devotion, determination, dedication, and religious conviction—of a hardy Carpatho-Russian people of God that migrated to America from Lemkovina. The majority of the migrants were from the villages of Malo-Celo, Novi-Sancz, which is presently under the occupation of Poland. Others came from areas now known as Slovakia and Western Ukraine. The town to which they came, Jermyn, had been incorporated in 1870 and coal mining was its main industry. This arduous coal mining work easily attracted the strong-willed immigrant from Eastern Europe who was determined to start a new life in America. The early Jermyn settlers had to walk to St John the Baptist Church in Mayfield for divine services until the time when they could build a church of their own. What we know of the early immigrants is that they arrived in the new land in the 1880s. Faith in God and hard work is the trademark of success among the early Russian Orthodox faithful in Jermyn. These early settlers of our humble town of Jermyn had to leave family members behind in Europe, and they worked very hard to pay off their debts and to save enough money to send for wives and relatives, thereby increasing the number of residents. The town of Jermyn kept growing with new immigrants coming every year. A Brotherhood was organized in 1902 as a prelude to organizing a parish and building a church for the future. The difficult work of organizing an Orthodox Church in Jermyn began with the seeds of the Orthodox Faith being sown by this Brotherhood. The humble beginnings of St Michael’s Church can be found in the faith and determination of the Brotherhood and in the founders, the early pillars who sighed the charter. On February 8, 1911, nine years after the formation of the Brotherhood, the Charter for St Michael’s Russian Orthodox Church was officially recorded in Lackawanna County Common Pleas Court. In June of 1907, ground was broken at the lower end of Lackawanna St for the new church school, and five months later the building was completed. Divine services were held on the second floor. The faith of the believers was put to a test when a disastrous fire destroyed the church on Lackawanna St during the tenure of Fr Nicholas Samosaiko. The hand of love was extended to the young but faithful flock of St Michael’s by the parishioners of St James Episcopal Church in Jermyn, who permitted them to use their church for divine services. Later the same year, land was purchased at the corner of Hudson and Walnut Sts. Igumen Anthony Repella arrived in Jermyn in 1909, having been assigned by Bishop Platon to serve the congregation as its first full-time pastor. Under his leadership and guidance, the young parish began to develop, mature, and grow in Christ. Construction proceeded on the new church building, and the tragedy of the fire had been turned into joy when, in 1919, Matropolitan Platon and Archbishop Alexander consecrated the new church dedicated to St Michael the Archangel. From the top of Hudson St the church always forms a picturesque view as she is seen nestled among the beautiful mountains in the midst of the beauty and splendor of God’s creation. Ground was also purchased at the upper end of Hudson St, in the borough of Archbald, for use as a parish cemetery, a final place of rest for the faithful members. The parishioners of St Michael’s were always industrious and intensely devoted to their church. Especially devoted are the women of the parish. In 1934, under the guidance of Fr Damian Krehel, St Mary’s Altar Society was established. The members of the Society continue until this day to play an integral and leading role in the life of the church. On Octobre 29, 1950, Bishop Nikon officiated at the dedication of the Youth Center. The name was later changed to St Michael’s Hall. In 1959 the parish celebrated the Golden Jubilee, with Archbishop Dimitry celebrating Divine Liturgy. During the pastorship of Fr Daniel Donlick, land across the street from the church was purchased for the construction of a new rectory, and the rectory was dedicated on June 3, 1973 by Archbishop Kiprian and Bishop Herman. The current pastor, Fr John Kowalczyk, was assigned to St Michael’s on February 9, 1985. Since then, over 50 new members have joined the parish. In addition to Fr John’s pastoral duties at the parish, he serves as Treasurer/Secretary for the Diocese of Eastern Pennsylvania, is an Instructor and Director of Field Work at St Tikhon’s Seminary, is the editor of the Alive in Christ, the tri-annual publication / magazine of the Diocese of Eastern Pennsylvania, and serves as a chaplain for the State Correctional Institute (prison) in Waymart, PA.
During Fr John’s tenure, many projects and renovations were completed, including the renovation of the church hall and restoration of the church articles, icons and articles. The latest project was the new church addition, which included an enclosure to the front of the church building and the installation of an elevator, a project which was blessed in conjunction with the parish’s 90th Anniversary, May 6, 2000. On July 1, 1990, a member of St Michael’s parish, Gabriel Petorak, having completed the Extension Program at St Tikhon’s Seminary, was ordained to the Holy Diaconate for the parish. Since then, he has continued his many efforts and labors for St Michael’s Church. In recognition of his labors, he was elevated to the rank of Protodeacon in 2000. Much has been done as we begin a new century and a new millenium. The work that we have accomplished is a labor of love and the generations that will follow us will realize that we worshipped our Lord Jesus Christ, worked hard for His glory, and enjoyed one another’s Christian fellowship. Much more will be accomplished in the years to come. We at St Michael’s are proud to consider ourselves as a faithful and obedient parish of the Orthodox Church in America. Please come and visit us when you are in the area.